Vermont is gearing up for its annual Town Meeting. I’m supposed to like it, as everybody else does. In the age of corporate, lobbyist-run government, it’s a last vestige of direct democracy. Town Meeting is a treasure, I’m told. I have to write about Town Meeting every year for the newspaper where I work. You want to write interesting articles about it. The Town Meeting folks don’t give me a lot to work with. 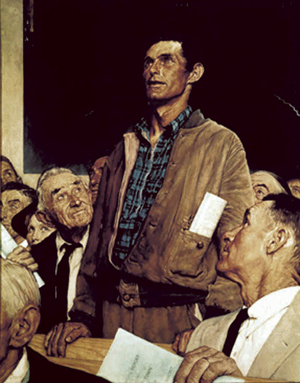 Town Meeting usually doesn’t exactly rise to the level of Norman Rockwell, homespun democracy at work, let me tell you. For instance, how do you write an engaging piece about how voters argued for four hours over whether to spend $500 on a new office copying machine or $250 to repair the old one? The culture clash that is life in small town Vermont is usually on full display at Town Meeting. The old timers who like things simple do battle with some of the more granola types. So you get long, heated debates over whether the new town highway truck should be fueled by free range organic native clover biodeisel. Or something like that. Some people go to Town Meeting because they like to hear themselves talk. And talk. And talk. Nothing wrong with asking questions about the town expenses, or complain about rising taxes. But think about it. If you’ve said exactly the same thing 220 times, and the rest of the voters aren’t swayed, you’re probably not going to make much headway. Town Meetings are prime places to play drinking games, but of course it’s hard to write a coherent article about the meeting afterward when you’re incoherent from 27 shots of Jagermeister. So I stay sober, but play the games vicariously. Point of order is normally a request from someone to make sure they understand how the procedings are working. Will a yes or no vote reduce the budget? that kind of question. Some people, however, yell “Point of order” over and over, I swear to bog down the procedings so much that people give up on the item that’s up for a vote. So one drink for each yell of “point of order.” Instead of drinking, I just mark down how many times it’s yelled. You take another shot for each time a member of the selectboard or school board up in front rolls his or her eyes at a stupid remark. That usually ends up as a really big number. Another shot for each time the lady next to you with a seemingly fatal head cold sneezes or coughs in your direction. You get the idea. My whines about Town Meeting are all selfish.So what if it can get boring? Of course voters get the job done, and at least they’ve (usually) decided for themselves how to run their town. If you’re interested in how it all works, get a copy of Frank Bryan’s book on the topic, to see how well Town Meeting works or doesn’t work. I just have to remember the basic good of Town Meeting in Vermont: At least something is in control of the average person. This entry was posted on February 27, 2010 at 10:27 am and is filed under Uncategorized. You can follow any responses to this entry through the RSS 2.0 feed. You can leave a response, or trackback from your own site. Used to attend Unitarian Church in NH and it was much the same–well-intentioned but boring people talking and talking and …. i’ve been going to my town’s town meeting for a few years now and i’ve never heard anyone say “point of order” i wonder what that says about my town. Unfortunately in most towns the business is conducted by very few citizens as most are working. In this respect Austrailian ballot is much more democratic. I just wanted you to know that I lifted your photo of Norman Rockwell’s famous painting to use as an illustration of my daily blog, THE PENULTIMATE WORD. (www.jedword.com) It is a perfect choice for your comments about a town meeting. It is also a perfect choice for my discussion of the use of the word “say.” Having lived in New England for much of my life, I have a profound gratitude for the Town Meeting…in spite of how frustrating it can be. It is one of the best expressions of democracy we have. Don’t give up on it.